A lot of posts have been related to my post but I could find one that fits so I thought I would start this. I have a full size violin, the back measures 14.25 inches (I don't know for sure if it's really a violin). I switched to 7/8 violin so this violin has been sitting around. This past weekend I had an idea - string it into a viola. When I started to look around for strings, I decided to just get a C strings and keep the rest of them. It turned out that only D string was a little short, so I added a fine tuner. They work fine so far. I have the strings on on Wednesday night and have played violin tunes on it and love the sound. However, I wonder if anyone have any input about how the difference of strings pressure would harm the violin? Thank you! I didn't know if I would like it or not, that's why I decided to keep the violin G D & A strings and only bought a C string. My violin strings was a set of Pro-arte so I got a Pro-arte C string to match. I know a violin E string could put 80 pound pressure on the violin, would A string do the same? I thought the thicker the string the lesser the pressure, so putting A string on E slot should have less pressure on the violin top, right? correct me if I am wrong. I felt the C string is so loose! It vibrates a lot when I draw my bow on it. I felt like I have to use a lot more strength on my bow arm to play on the "viola." Would a viola bow better? I can't read alto clef easily yet so I basically just play all the violin songs on different scale, e.g., playing a song that was written in A major scale in D major I do like the sound a lot, so I probably will keep it as a viola. Yes, the C string will "feel" loose to what youre used to. I play my 16.5 Viola with a carbon fiber fiddlerman violin bow. The couple more grams of a viola bow will help draw the tone, but if you adjust a little pressure the violin bow will do alright. Ive have been transposing and making my own backing tracks with my guitar to play along with. That C is a lot of fun,isnt it ? Yes, very deep voice! It sounds calm and sounds like a cello. My daughter and I played together last night, she played the songs in right keys and I played them perfect fifth below, they don't sound harmony to me. I guessed I could try to play an octave below and see how they sound together. We just played twinkle together in same key; she played the harmony I played the tune and it sounded great together. I wish we could do more like that but we have to find some tunes first. oh boy.. oh boy.. sounds like fun.. I am soooooo going to do this..
Then again.. i could sneak a viola in to the house..
Kim.. I got your pm... I will send you pics.. lots of them!! Thanks for the pictures in advance! 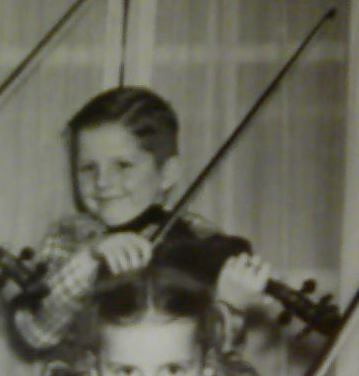 I think I will ask my teacher how to play the viola with my daughter in harmony. May be I will get Suzuki viola book and see if that would work. I would love to try a five-string violin, but I probably will bump into strings a lot as I already do with four-string violin. A 5 string in the electric silent variety are very reasonably obtainable. I'm into mine for the whole of $130 but you have to play thru an amp. It's crazy fun to play. I'm very happy and find myself playing only the 5 string and neglecting the other 5 acoustic ones. The bridge is the same as used on a 4 string but the spacing of the strings is slightly different. The highest 4 strings are right at 8.7-8.9mm apart, the C string to G string is just over 10 so the radius of the top of the bridge is slightly more curved than the standard 42mm radius. It makes it easy to bow and I find it easier than the standard 4 string violin. Maybe I'm just getting used to it. hmmm, more curve than 4-string violin, with my small hand and short fingers, it will probably even more difficult for me to play on C string. My question is: can I fix a 4-string violin into a 5-string violin? I mean the body, say I have a violin kit so I could get a scroll for 5-string violin and fit the bridge for it, would that work? @denny, what kind of strings do you use on your electrical? Thanks. We have actually had that done pky. Considered having them done in great quantities in China for the Fiddlerman 5 string. Provided you have enough space on the nut and do not thin out the top too much, you should be good. The added pressure of just the one string doesn't seem to cause any problems. Long term - Who knows!!! One tip I have is to set up the 4 normal strings exactly the way a regular violin is set up and to add the C string peg way up on the left above the D string peg. This way you can purchase normal violin strings and one viola C string to match. Realist does it this way and I like it. You need to give some thought as to which string you are tuning at first but you quickly get used to it. I was fortunate enough to have a loan of a 5-string ( electric ) for a few weeks - nice. I then replaced the viola C with a Thomastik Vision violin C string (intended and designed for a 5-string e-violin although this was fitted on an acoustic) - and it is much less "floppy" and does not need so much "digging in to" with the violin bow, and (for me, where I am in my ability) I find it much more "playable"
Some 5 string violin have wider necks but not all of them. I like your idea of a 5 string better than your teachers. To reach the lower strings try bringing your left arm more under the instrument when playing on them. I just recently put a C string on my "Concert Master" and moved the other three strings to the right eliminating the E and creating a mock viola.